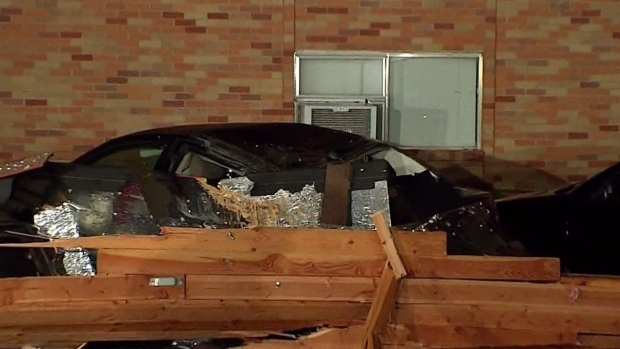 Severe thunderstorms packing winds of up to 90 mph tore through the Dallas-Fort Worth area Thursday, ripping a roof from a college building in Arlington, toppling a brick wall in historic Fort Worth and leaving thousands in the dark. The fast-moving storms left widespread damage and power outages in the their wake Thursday afternoon across North Texas, as winds downed utility poles and large tree limbs. Winds ripped the roof from the girls' dorm on the Arlington Baptist College campus. Lt. Lee Tovar with the Arlington Fire Department said one student was transported to a local hospital with non-life-threatening injuries. "Right when I moved, the glass just broke in and shattered," freshman Courtney Garcia. "I had to put my hand up to see." Junior basketball player Shanice Hill, 21, said her vehicle was one of six that was damaged during the storm. She said her insurance company told her it was likely an Act of God and the damage would not be covered. She said her laptop, TV and most of her clothes were also destroyed during the storm. Arlington residents are still dealing with damaged property after Thursday evening's severe storms. "I’m going through a lot right now," she said. "The bottom floor is flooded, a lot of my clothes are wet, and so, it’s a hard time for everybody." Many of the students had gone home for the weekend, but those who were there said they ran into the lobby as the roof started to peel away. The debris damaged several cars in the parking lot. Until the building is fixed, no one will be allowed to stay there. Family, friends and churches in the area are helping the displaced girls until a long-term solution is found. The Arlington Independent School District canceled all classes and closed their offices, officials said. The University of Texas at Arlington also closed Friday due to a partial power outage. School officials said all classes are canceled and all offices closed. Chopper 5 also spotted major damage at JD Higgins Company in the 1600 block of Industrial Court in Arlington. The roof was ripped off exposing the inside of the building to the elements. 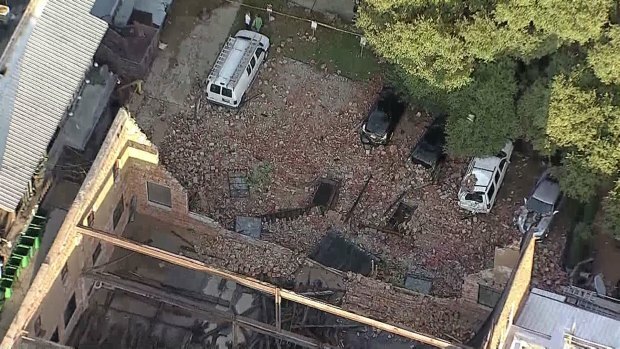 Storms also triggered a building collapse in the Stockyards in Fort Worth during the height of the storm, the fire department said. The back wall of the old Stage Coach Hotel at 2408 North Main Street collapsed during the storm. The collapse sent nearly 100 old bricks smashing down onto eight cars parked below. The wall of an old building in the Fort Worth Stockyards was torn down by strong storms Thursday afternoon. Fort Worth Fire is concerned the other three walls may not be stable and have evacuated neighboring buildings, including the Lonesome Dove Western Bistro, Maverick Fine Western Wear, Elephant Saloon and Love Shack. North Main Street is closed between NW 23rd Street and NW 25th Street. It’s unclear how long the closure will be in place. No one was injured, but eight vehicles were damaged, some totaled. Numerous sheet metal sheds were mangled, and a limb crushed an unoccupied car in eastern Fort Worth. 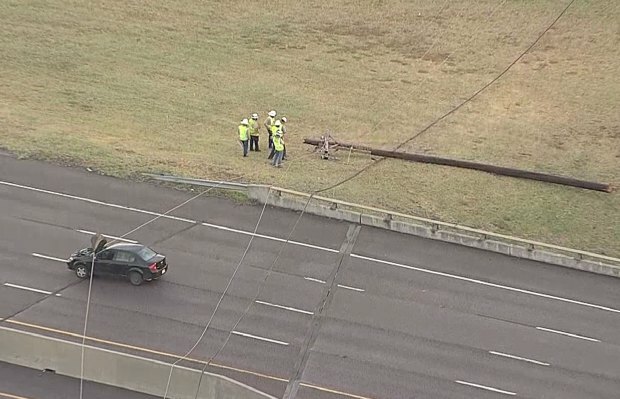 The Dallas County Sheriff's Office says wind is to blame for power lines and a fiber optic line being torn down across Interstate 20 at Cockrell Hill Road. No injuries were reported, from Chopper 5 one car could be seen with the power line across its hood. The lines came down around 4:25 p.m. and the roadway was closed for nearly four hours. NBC 5's Amanda Guerra reported the roadway reopened around 8 p.m. but not before mothers and their children abandoned their cars on the highway to go to a nearby gas station for food, water and restrooms. Storms on Thursday afternoon knocked a power pole over, leaving lines lying directly across Interstate 20, closing it for more than four hours. In Dallas, traffic lights were out for a large section of Lake Highlands and along Greenville Avenue, east of US-75 Central Expressway, Thursday evening. The stop arms at several DART light rail crossings were down for hours, including the crossing at Audelia Road, just south of I-635, causing lengthy traffic delays. 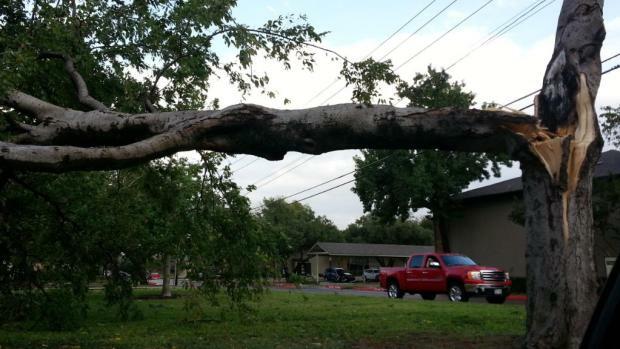 Severe storms rip through North Texas, causing damage in several areas, including University Park. NBC 5 crews came across two massive trees that were uprooted buy the storm. Power poles and large street signs were knocked down in the area around Southern Methodist University. The Dallas Independent School District closed at least 48 schools that were still without power Friday morning. Some Grand Prairie residents spent the day off work cleaning up after the storm. Fences and trees were torn off due to high winds. The Grand Prairie Municipal Airport was secure and operational despite damages to hangars and planes. Hong Kong Market Place inside Asia Times Square had to close due to a power outage. Multiple intersections didn't have working signals, so temporary generators or stop signs had to be placed there instead. A billboard along Pioneer Parkway west of 161 bowed low as it gave from the pressure from Thursday's severe weather. As of Friday afternoon 7,000 residents were still without power. Crews from the city and Oncor have been working around the clock to restore power. Frisco firefighters said a house fire in the 12200 block of Blue Ridge Drive may have been caused by lightning. The City of Frisco said a neighbor who called 911 reported seeing lightning strike the two-story home at around 4:25 p.m. No one was at home at the time of the fire. One firefighter was treated for a minor injury. Denton County was hit early in the storm seeing heavy downpours and up-to baseball sized hail reported in some areas. Besides some flash flooding and tree damage though, the area dodged the worst of the storm. Warning: Foul Language An NBC 5 news crew covering the Ebola health threat captured this video of severe storms whipping through Dallas and tearing through the media tents outside Texas Health Presbyterian Hospital in Dallas. A North Texas teacher was hurt by lightning during the storms. A fourth-grade teacher at Lamar Elementary School in Denison, about 60 miles north of Dallas, was hospitalized after she was hit by lightning while holding an umbrella and helping a student get to a parent's vehicle Thursday afternoon, according to Henry Scott, superintendent of the Denison Independent School District. "She reached out to get the door handle, the lightning struck and it either came through the metal part of the umbrella, we don't know for sure, it affected her, it kind of knocked her backwards," Scott said Friday. The child wasn't hurt. The teacher, whose name was not released, managed to return to the building and the principal called 911. She's expected to recover, Scott said.